Bobbie Pyron, author of A Dog's Way Home, shared this story of her three dogs. Visit her website to learn more about her books. The most common question writers are asked is "What inspired you to write your book?" 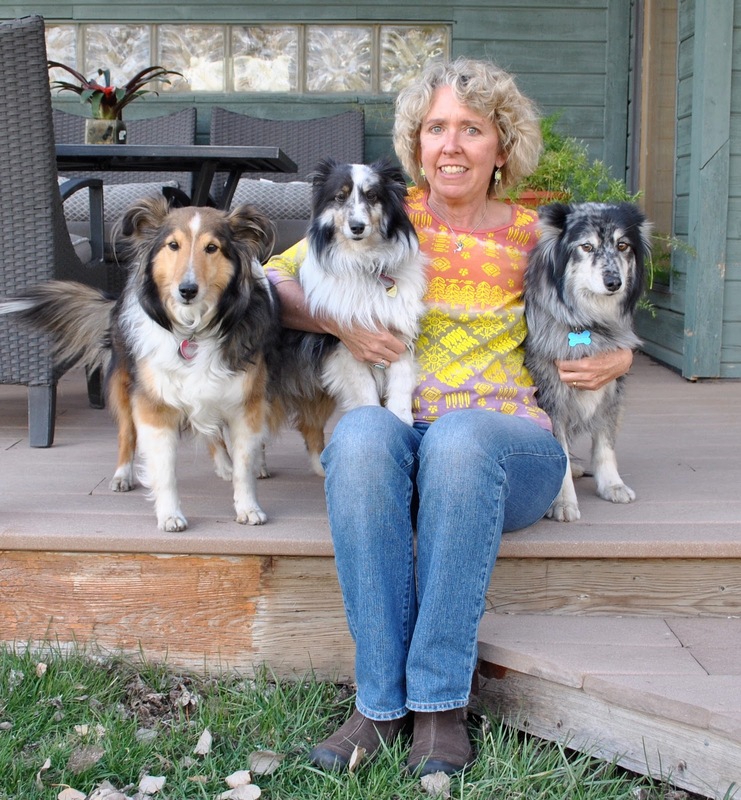 For my new book, A Dog's Way Home, the answer is wonderfully simple: my dogs! I am fortunate to share my life with three rescued dogs; two—Teddy and Sherlock—are Shetland Sheepdogs adopted from Sheltie Rescue of Utah. My third dog is my "wild child," Boo. My vet's best guess is she's a coyote mixed with some sort of herding dog. A Dog's Way Home is a contemporary mash-up of Lassie Come-Home and The Incredible Journey featuring a lost Sheltie rather than a collie. I like to say the book is my personal love letter to the breed. I first fell in love with Shelties when I fell in love with Teddy. We met when he was four years old. He and his sister had been given up to Sheltie Rescue when their family fell on hard times and had to sell their house and move in with family—family who would not let them bring the dogs. Teddy’s sister got adopted right away. Teddy waited for me. When we met, it was clear from the beginning we were meant to be together. I have never been loved as deeply by any dog as I have been by him. He would be perfectly happy if he could somehow be surgically implanted in my side! 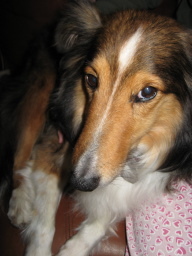 He was my muse for Tam, the devoted Sheltie in my book. Now that he is nearing 13, he no longer hears me call his name, and those gorgeous chocolate almond eyes are fading. But if possible, we love each other more than ever. Sherlock spent the first three years of his life in a tiny cage in a puppy mill. When the puppy mill was busted, he and the other Shelties were lucky enough to land at Sheltie Rescue of Utah. They were all in terrible shape—underweight, terribly malnourished, and cowering. When I first adopted Sherlock, he was terrified of stairs, had no idea what grass was, bumped into furniture, and had to have several teeth extracted. Now, three years later, he loves, loves, loves to run, play ball, wrestle with his "big sister," Boo, and cuddle as close as he can with me. He is truly a testament to the resilience of dogs. Boo was the first of my rescued pack. A friend of mine who ran Wasatch Humane [now the Utah Animal Adoption Center] said she’d pulled a feral street dog from a "kill shelter" who needed an experienced dog lover. She warned me that the dog was fairly wild and aloof, but would I be willing to meet her anyway? My husband and I drove north to meet her. What I saw was a scrawny, scrappy blue merle coyote. What she saw when she was brought into the room to meet us was my husband’s waiting lap. She threw herself into it and gazed up at him adoringly. Needless to say, she came home with us. My vet confirmed that she probably was a coyote mix of some sort. "She’ll be one of the smartest and most challenging dogs you'll ever own," he said. And he was right. In my book, the Sheltie, Tam, is befriended by a young coyote, a character inspired by Boo. All dogs inspire us, I think. They inspire to be better than we are, to live in the moment, and to play. But there's something extra inspiring about a rescued dog. They inspire a kind of compassion, love, and open-heartedness not found elsewhere. They rescue us. I love this story! It expresses the bond and trust that these animals place in us to mend old wounds. I've read "A Dog's Way Home" and it is a wonderfully written story--I recommend it for dog lovers of all ages!